Change radio sounds by model. Upload plugin to your server. Add your models and sounds to kento_radio.cfg, and don't forget to upload sounds to both server and fastdl. Some anime sounds and zombie sounds from CS:NZ are included in sound folder, but you have to add it in cfg by yourself. Here's a list of available radio commands. This plugin doesn't have any cvar. This plugin doesn't have any command. Fix custom radio not working in some maps. Fix custom radio not working in bot. 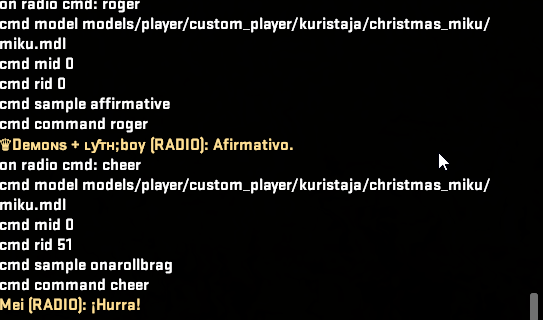 Fix custom radio not playing in some commands. Remove "negativeno", it's same as "negative". Unhook radio command event, it's unnecessary. iNewsekai - I take idea from this best anime theme server in my country. Last edited by rogeraabbccdd; Today at 10:59. It works fine with radio commands but automatic responses are not working (throwing grenades, planting, etc.) It also looks like break something in soundcache, because I hear throwing grenade responses every time I'm picking up/buying items. Last edited by Gazyi; 04-12-2019 at 04:56. Reason: Got it somewhat working. Hi, I found there are some bugs in this plugin, and I'm fixing it. New version will release soon. Thanks for update. I also tested with bots. Now bomb planting response works but grenade responses still don't (buffer and sample vars are empty in debug message). Any ideas why models with only numbers in name fail to be added into g_model array? Last edited by Gazyi; Yesterday at 07:00. Hi, I have fixed your model problem in latest version. You have to remove your // in your grenade sound setting. helloo do you have anime models like in your video?